Reading: Is Anyone in the Room? Utilising a test house built to the author’s design in North London as its case study, this essay describes the need for reliable occupancy sensing in houses where automatic room-by-room environmental control takes place, before going on to discuss the complexity of transient room-by-room occupancy in this type of building. Doors are usually thought of as being kept closed in our homes. When however the doors are kept open, as is often the case, the house is identified as being generically different from a spatial, social and an environmental point of view. The essay makes the case for reliable local sensing on a room-by-room basis that is private and not dependent upon the Internet. Possible sensing devices are discussed, and the essay then goes on to analyse the combined use of PIR (passive infrared) and CO2 (carbon dioxide) sensors in the case study dwelling. The building is ventilated by a whole house heat recovery system (MHVR) and the results are provided for various conditions: a) doors and windows closed; b) doors open and windows closed; c) doors closed and windows open; and d) doors open and windows open. The paper concludes that in the first two of these conditions the combined sensors will robustly indicate occupancy in the house, and that local machine learning could support PIR-only sensing in the latter two conditions. The late Isi Metzstein, one of Scotland’s foremost post-war architects, once described the motivation of architects in the following (gender interchangeable) terms: ‘Every architect has a good reason and a real reason for what he does; the good reason is the one that he tells the client, the real reason is the one that the architect tells himself’ . This essay likewise has a good reason and a real reason. The good reason is based in energy conservation, and the way that buildings can be understood and managed to reduce energy consumption. The real reason is the author’s long-term interest in the way that dwellings are occupied over time and how we might make buildings that both allow these changes to take place and respond to them. Reyner Banham’s renowned book on The Architecture of the Well-Tempered Environment  was published in 1969 as a celebration of the ability of human beings to modify their environments at will through the use of mechanical equipment. The energy sources that were required for this were unquestioned at the time. Four years later, however, the world experienced the first ‘oil shock’ when in 1973 the members of the Organization of Arab Petroleum Exporting Countries proclaimed an oil embargo with significant effects on the world economy. This had been preceded in 1972 by an important publication, Limits to Growth , which reported on a computer simulation of the negative effects of exponential growth in global economic and population growth on the finite level of world resources. These two drivers brought an environmental movement into being which sought, in the area of the built environment, to stabilise or reduce energy consumption in buildings. Many innovative ideas were developed over the period from 1972–80 and some of these, relating to building insulation, were enshrined in legislation. At the end of the twentieth century the environmental movement was reactivated by evidence of environmental pollution arising from energy use leading to the possibility of runaway climate change and the phenomenon now known as ‘global warming’. One result of these drivers has been an urge to find ways of actively changing the performance of building envelopes so that they respond to differing environmental conditions. Another result has been an urge to avoid reliance upon mechanical systems of heating and cooling. A third result is to seek ways of ‘switching things off’ whenever occupants are not in a building or part of a building. A fourth result is to seek ways of modifying the expectations of occupants with regard to internal environmental conditions. The Active House project described in this essay is hence an attempt to link an actively modifying building envelope to a way of ‘switching things off’ and of possibly modifying occupant behaviour and expectation. Michael Mozer has produced the most authoritative work on switching things off and modifying behaviour . He makes the assumption that a building that has ‘intelligence’ in this way must have a goal, and that user interfaces must be simple. His work is the precursor of devices such as the Google Nest thermostat. In his much-quoted essay, ‘Figures, Doors and Passages’ , Robin Evans describes how the corridor with a row of rooms off of it, each with a single door, was a sixteenth-century European invention that reached its most elaborate outcomes during the nineteenth century. Prior to this date, interior rooms – and especially grand rooms in grand houses – opened off each other to give a rich mix of permeability throughout the dwelling with very little privacy. Later plans show major rooms being entered off corridors with an alternative progression whereby all of the major rooms could still open into each other to create impressive receding vistas. This allowed the occupants to create the most opulent events when all the latter doors were kept open, leaving the corridor for servants to use. The nineteenth-century predilection for rooms accessed by single doors from corridors is usually attributed to prudery and a search for privacy. However, it is also probable that the doors to individual rooms were usually kept closed in cold weather in order to keep the heat in rooms with fires and to reduce draughts. Personal memories of an early childhood in a large house that was only heated by coal fires and small radiant electric heaters fires suggest that this indeed was the case. Evans argues that we can see an adoring family intimacy in many of Raphael’s paintings and that this was then reflected in the plans of the Villa Madama that he helped to create. The end of many of the nineteenth century’s prudish attitudes to domestic intimacy coincided, certainly in Britain, with the widespread adoption of domestic central heating during the mid-twentieth century: after this it became possible for all but the very poorest citizens to leave their doors open, or to take them off completely. It is in this context that we must ask whether a room with its door open is still a room, or is it part of a wider entity called a dwelling (or part of a dwelling) that might also contain other rooms with their left doors open? This paradox could be viewed as a formal architectural question or a social science question, but in the context of this essay it is also a physical and experiential question. The issue is that, if doors are open, air and heat migrate around the dwelling to a point where the room cannot be considered to be a stable entity from a thermal point of view; similar considerations also of course apply to light and sound. However, this is not a one-way journey. Many of us are now familiar with dwellings in which independent and different Internet activities are housed in individual bedrooms, with the communal domestic spaces hardly used. A dwelling where spaces lead off each other in a loose informal way can become a place of segregated territories and rooms whenever relationships become distant, whenever children grow older, and whenever financial circumstances change, with the home becoming in effect a place of separate tenancies. The domestic sector consumed 30.5% of the UK’s final energy in 2010 , and a similar condition still prevails today. Unsurprisingly there have been numerous research projects directed at attempts to reduce this level of energy consumption, and many design strategies and products have resulted from these. The most significant strategies and product specifications are embodied in legislative measures by the British government with regard to building insulation, window area and orientation, ventilation methods, and heating systems and controls. Some of these legislative measures have perhaps unintended consequences. The author’s own Active House project  is for instance a response to the impact of legislation on window area and orientation. This wide-ranging project seeks to demonstrate the inherent possibilities that arise when highly insulated shutters are deployed over windows, by recording and studying the implications of this approach for design and the control if automatic operation is attempted. This essay here thus discusses one aspect of automatic operation systems, namely the detection of occupancy within a domestic context. 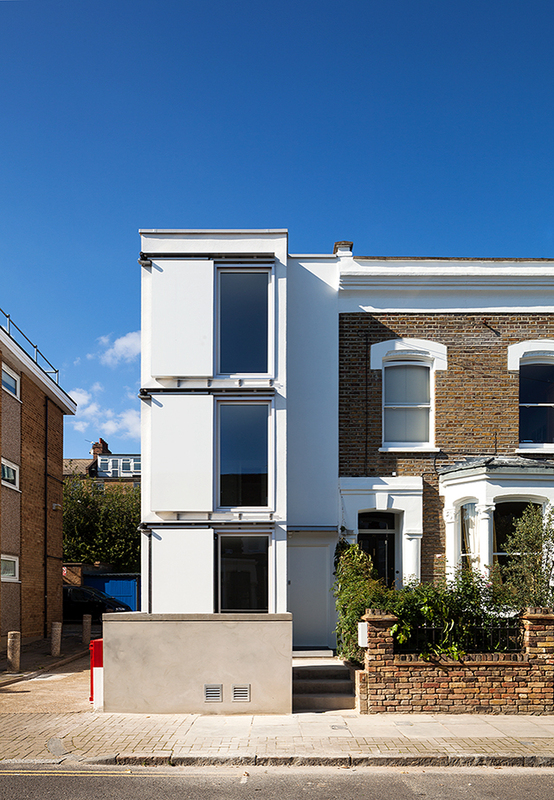 The case study for the Active House project is a small end-terrace dwelling built a few years ago now to my designs on an infill site at 70a Corbyn Street in Finsbury Park, North London. 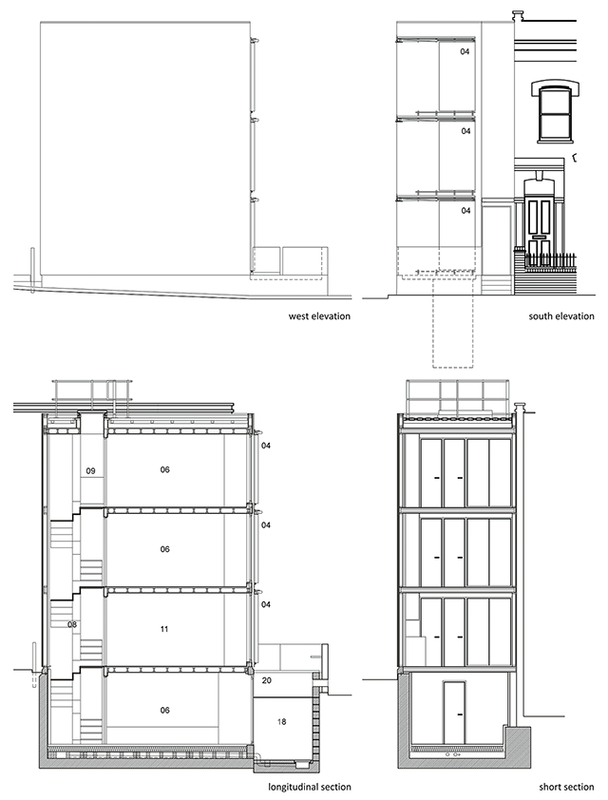 It comprises a four-storey house with a very small footprint of 6 metres × 3.4 metres (Figure 1). Site constraints were considerable, with no access or possible fenestration to the side and rear of the building. There is a small raised front terrace. The house is constructed out of prefabricated timber panels with cassette floors and roof, and is built over an existing concrete basement. Each of the four floors consists of a main room and an adjacent service space (Figure 2). 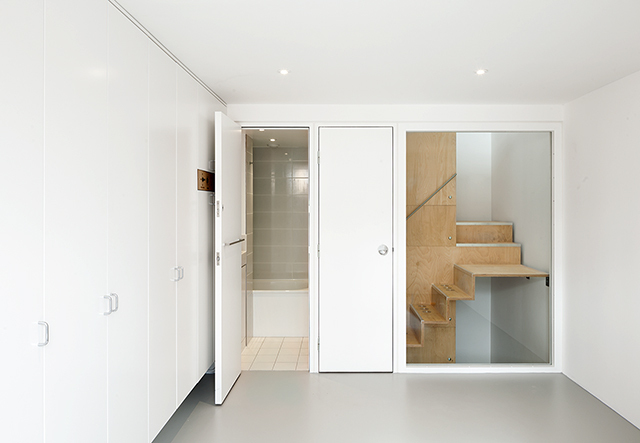 The rooms on the ground, first and second floors have glazed screens to the purpose-made staircase (Figure 3), with the screens fitted with bi-fold shutters to provide privacy when needed. Heating is underfloor, and a whole house heat recovery ventilation system is fitted. 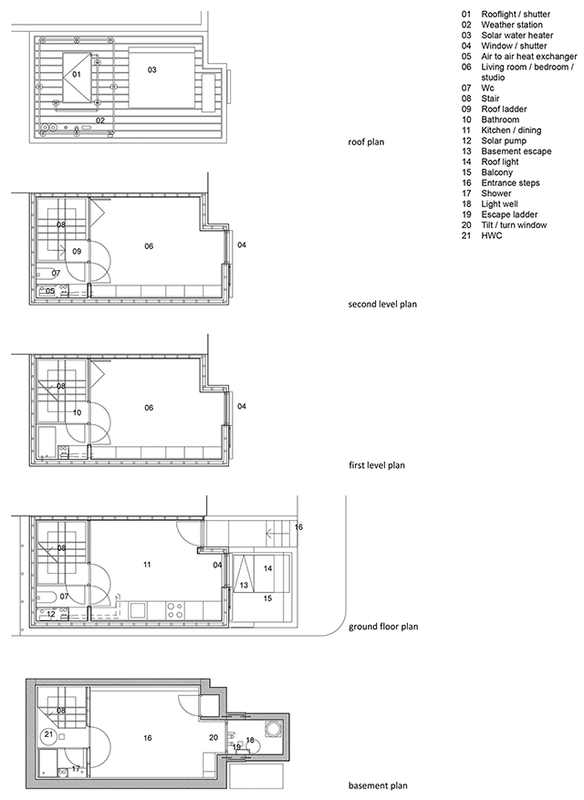 The Active House’s plans, sections and elevations are shown in Figures 4 and 5. Exterior photograph of the Active House at 70a Corbyn Street, London N4, UK [Photograph: Andy Stagg]. 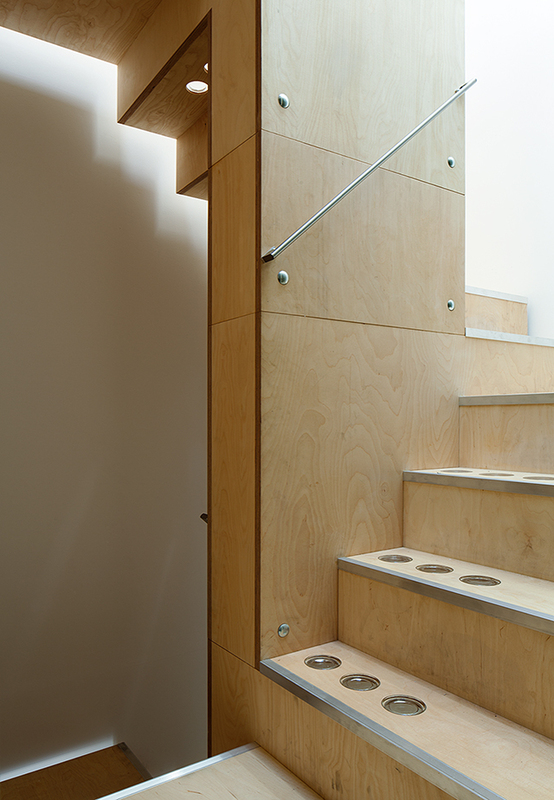 Interior view of the Active House [Photograph: Andy Stagg]. Floor plans [Image: Stephen Gage]. Sections and elevations [Image: Stephen Gage]. The Active House has various components that are designed to change state. Each of the rooms from the ground floor upwards has a south-facing inward-opening window with a thermal shutter that slides over it. 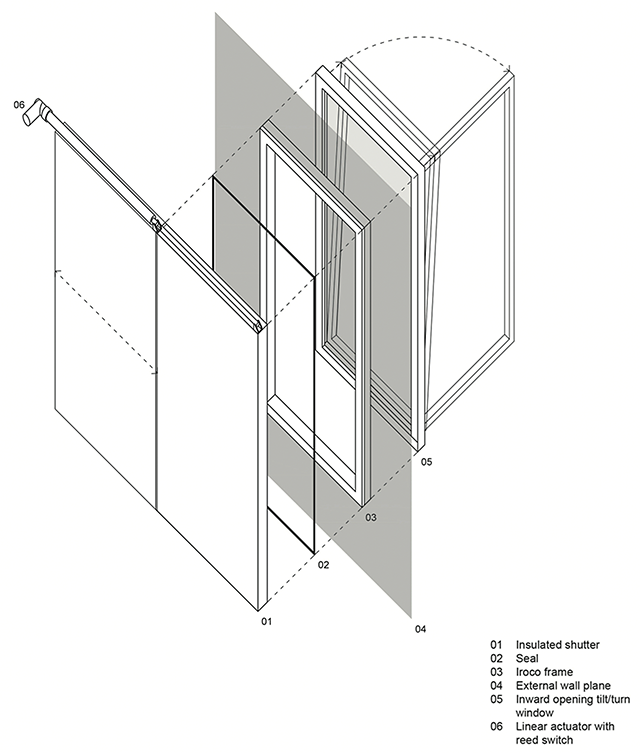 Figure 6 shows how these proprietary inward-opening tilt-and-turn windows are lined externally with Iroko frames and purpose-built shutters (made from insulated truck panelling) that have been constructed to slide over them. The shutters are fitted with polypropylene seals that are translucent and thus allow a measure of internal illumination to the edges of the shutters, causing them to appear as if they are ‘floating’ in front of the windows when they are closed. The shutters are driven using 12-volt linear actuators linked to a sensing and operating system. The actuators are fitted with reed switches, allowing very accurate variable movement limits. Window and shutter detail [Image: Stephen Gage]. The ground-floor room has three doors; all other rooms have two doors, allowing the service spaces to be accessed either from the staircase or else from the main room on the first and second floors, offering the choice of en-suite or shared service facilities. All of the rooms have switchable light and heat sources, and, importantly, all rooms are the same size. The ground floor contains a typical range of domestic equipment, while the uses of the rooms on the other three floors are not fixed. There is a whole house air-to-air heat recovery ventilation system that runs 24/7. Yet with the exception of the purpose-built external thermal shutters the dynamic components in the house are typical of the increasing range of moving and switchable components found in a typical twenty-first century dwelling in Britain. The current occupants of the Active House are a young professional couple. She manages a growing design consultancy; he is a partner in a new design practice and also teaches design on a part-time basis. They work long hours both in and out of their home, and take time off and away whenever they can. At present the basement is being used as a store and an occasional workroom, the ground floor is fitted as a kitchen and dining area, the first floor is being used as bedroom, and the second floor is being used as their living room. This is a substantially different pattern of use from that for instance of a family with young children or of a retired couple. Is anyone (not) in the room or the house? The Active House needs to know continuously on a room-by-room basis whether it is being occupied or not. For example, this knowledge allows it to close the external shutters to conserve heat in winter and to open them in spring/autumn for beneficial solar gain, only to close them down completely during the summer to prevent solar gain without the risk of inconvenience the occupants. The heating systems and lighting systems can be similarly controlled but, as part of this case study, it became clear that it was especially important to know whether the Active House was being lived in as a single zone or else as a multiplicity of zones. If we know when domestic occupation is predictable, then we can prepare a space or spaces for occupation. This requires that occupation sensing is available and able to feed data into a learning algorithm. When the research project started, however, it was thought that room occupation sensing would be a trivial issue and that appropriate sensors would be simple to find and use. Sensors to establish whether doors were open or closed were not fitted because of the multiplicity of doors within each space. Yet soon enough it became apparent that this was creating problems, and the subsequent search for an appropriate form of occupancy sensor is therefore the subject of this essay. It is one of everyone’s least favourite day-to-day memories. You go to the toilet for a contemplative voiding. The light goes on when you go in. You sit down with a sigh. After two minutes the light goes out. If you are lucky a mad waving of the arms will put the lights back on. The sensor has decided that you are no longer there. You have been the victim of a false negative. After your complaints, another sensor is procured for the toilet. You go in and find that the light is already on. You invent a reason, perhaps that the manufacturer has developed a device that anticipates your need. When you leave the light is still on. In reality, the sensor manufacturer has raised the sensitivity of the sensor to the point where it believes that you are always there. Your bank account has been the victim of a false positive. Both of the above scenarios are common enough and are intrinsically unacceptable, especially in a domestic environment where the inhabitants like to believe that they are in control. The challenge is considerable, because in a domestic context it is as important to know whether someone is in as space when they are asleep as it is to know that they are active and awake. Infrared thermopile array cameras can be ceiling mounted to act as people counters at the entrance to a space and indeed are commonly used in this way at the entrance to shops . The cameras will detect movement, and they will also detect a static heat source such as a person. They do not identify individuals. Based on this precedent, 16-pixel thermopile array cameras were installed in each room in the Active House for these reasons. It proved to be difficult to analyse the output from the pixels so that occupancy could be inferred. This problem was eventually overcome by calculating the mean of each pixel individually over about 5 seconds and then storing each of them individually. At any given time, it then calculated the deviation of the current value from the baseline for each pixel and summed these up to give a single value. This was then compared to given thresholds to infer occupancy. Yet these thresholds proved difficult to calibrate. Cameras were situated over the windows to look inwards to the rooms so that changes in external radiant heat sources could not be ‘seen’ by them. This siting position created a camera blind-spot in each room that meant that an occupant could temporarily ‘disappear’. More seriously still, the detection of body heat was effectively shielded by bedclothes, which meant that sleeping occupants could ‘disappear’ all night. The overall rule base for thermal shutter operation in the Active House arises from the interest that its occupants have in growing indoor plants. Thus the external shutters are opened whenever possible to give maximum light to the plants. There are however limitations. Shutters do not automatically open when it very cold outside or when there is the risk of unwanted solar gain. They also should not open automatically in the morning when the occupants are still in the room, for a number of obvious reasons. But they did, and no amount of reprogramming seemed to overcome this problem. 2017 will bring a continued and massive increase in cyber-attacks brought about by IoT devices. Most IoT devices manufactured today have no integrated cyber defense and do not allow third parties to install security software. To address this concern, manufacturers recommend that security for IoT devices is achieved by installing behind a firewall, which is no longer a guarantee of safety in today’s environment. Once IoT devices are compromised, they can then provide a back door that serves as a clandestine communications channel for months before discovery’ . It does not require much imagination to envisage a bespoke dark-web service for professional burglars that identifies vacant houses, or vacant rooms in occupied houses, and then matches these to knowledge about homeowners’ wealth figures and possessions. It also does not require much imagination to envisage the chaos that would be caused by a mass DOS (denial of service) attack on a widely available internet enabled device, such as a type of domestic freezer in summer or a type of thermostat in winter. When the Active House portfolio  was being prepared, the Internet of Things was just a hope for the future. Recent events suggest that it might become a nightmare that is best avoided . There are further issues with the use of sophisticated sensing devices when they are capable of recognising individuals. They move from being servant devices to becoming potential tools of mass surveillance. It could be useful in certain circumstances to know who is in every room in your house at all times, but potentially disturbing if this information were to become available to the world at large. CO2 (carbon dioxide) sensors: These are used on a regular basis to infer occupation levels in mechanically ventilated buildings so that ventilation rates can be increased as occupation numbers rise . However, CO2 sensors do not immediately respond to occupancy, and are not regarded as being effective in domestic buildings where doors and windows may be left open . Temperature and humidity sensors: These can also be used (with caution) to infer occupation because human occupants give off heat and water vapour. Recent theoretical and experimental work has focussed on the potential of using multiple sensors to create a richer information environment . Generally, this research work concentrates on the way that multiple arrays of these sensors can work together. In this essay, in contrast, we are looking at the possible advantages of combining the feedback information from two, simple and dissimilar sensors in order to gain an enhanced result. Combination sensors are well known. The best-known devices are multiple climate sensors, of which the internal models include the Google Nest thermostat. As well as an air temperature sensor, it includes a light sensor and a PIR movement sensor to detect local occupancy . Another multiple internal sensing system is the ClimateSensor produced by Sense Anywhere. The ClimateSensor includes temperature, humidity, CO2, and PIR sensors . Both the Google Nest thermostat and the ClimateSensor are digital cloud-based devices and thus are vulnerable to being hacked. The ClimateSensor is also only designed for large commercial installations. The main shortcoming of the infra-red thermopile array cameras that have been fitted in the Active House is that they cannot identify occupancy on a reliable basis when the occupants are asleep. A secondary drawback is that it is not possible to infer zones of occupancy in the house as a whole, with the cameras being difficult to calibrate. It occurred to me therefore that we should investigate the use of a sensor that reliably sensed movement linked to a sensor that could detect long-term occupation of space. Naghiyev, Gillott and Wilson  compare three domestic occupancy measurement technologies: PIR, CO2 and DfL sensing. The main thrust of their work is to explore the effectiveness of DfL sensing; however, they also show the limitations of the other two modes of sensing. In their paper, the use of PIR sensing shows all the usual drawbacks, although it forms the backbone of many domestic intruder alarm systems, being cheap and, within its limits, reliable. 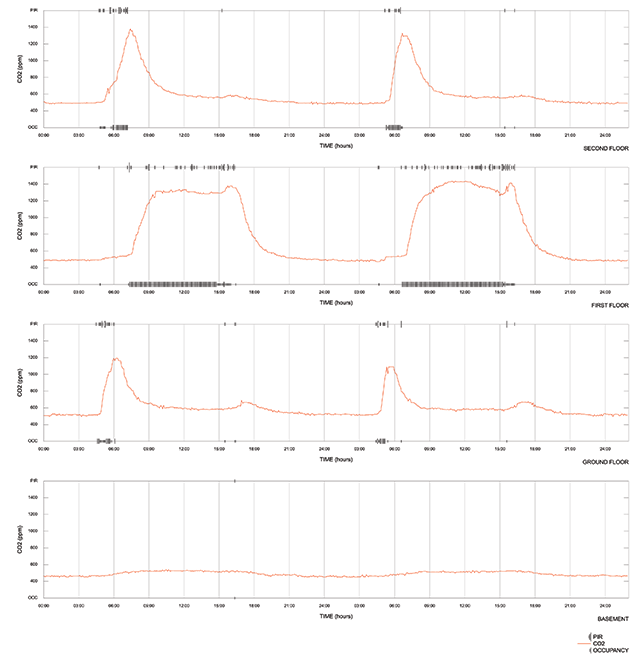 In the same paper, CO2 sensing gave ambiguous readings, until we realised that most of these readings were taken in a house with all its doors open in an attempt to identify short-term occupation. This was immediately suggestive. Could CO2 sensing be used instead to identify long-term occupation and thus indicate when spaces were open to each other? Taken together, could PIR and CO2 give the required information for the Active House project? A series of experiments was thus devised to investigate how effective it might be to combine these two sensing systems. Each of the 4 main rooms in the Active House were duly fitted with PIR KumoSensors sensors, which logged the occupants’ movements every 15 seconds, and Eltek TU 1066 CO2 sensors logging CO2 levels in ppm (parts per million) every 5 minutes. The PIR sensors were situated to face the bed position on the first floor and were similarly situated on the basement, ground and second floors. Doors closed, windows closed [Tables: Stephen Gage]. Doors open, windows closed [Tables: Stephen Gage]. Doors closed, windows open [Tables: Stephen Gage]. Doors open, windows open [Tables: Stephen Gage]. It is possible to see the number of room occupants in most conditions. Further analysis of the results shows that it is indeed possible to begin to construct an algorithm that will take the results from the CO2 and PIR inputs to give a reliable indication of when rooms in dwellings become occupied or unoccupied, and to understand whether a room is connected to the rest of the building or has been isolated from this external influence. In order to do this, we need to describe the PIR ‘hit rate’ and compare this with the changes in CO2 levels. For describing the PIR ‘hit rate’, PIR data was accumulated every 5 minutes to match the frequency of reporting of CO2 levels. 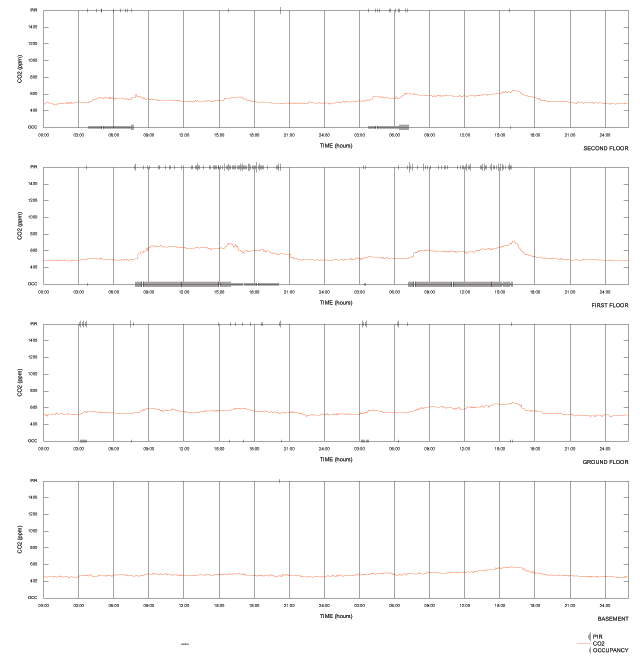 The time intervals between accumulated ‘hits’, when rooms have been reported to be in occupation, varies in the data between 5 minutes and 55 minutes, with the mean being every 15 minutes. We might then make the following conditional statement for this installation in the Active House: without parallel CO2 sensing to help, occupancy must be assumed for 60 minutes after a PIR ‘hit’. If no ‘hit’ occurs after this time period, then the space can be assumed to be vacant. In terms of describing changes in CO2 levels, the unoccupied threshold levels in all rooms and all conditions are tabulated in Figure 11. These are low (i.e. below a mean of 540 ppm) taken as a rolling 5-minute sample with a standard deviation of 17 ppm. It should be noted that these levels become raised in conditions where other rooms in the house are occupied and doors are left open and the windows remain closed – the so-called ‘ghost’ effect. This is best illustrated in Figure 12 where the CO2 levels are overlaid in the windows closed, doors open condition. Unsurprisingly, the CO2 levels whenever the Active House’s rooms are occupied are substantially higher than these baselines. Figure 13 shows the mean occupied signal height for all four of the building conditions, while Figure 14 shows the signal height that can be derived relative to the mean baseline. It should be noted that the CO2 levels whenever doors are closed in the Active House are somewhat higher than the average peak levels cited in the meta-analysis of the MVHR dwellings using the Technology Strategy Board’s building performance analysis programme by Ian Mawditt, Tim Sharpe and others . This possibly arises because the rooms in the Active House are small, and its overall building area is so low. Unoccupied room CO2 level analysis [Table: Stephen Gage]. Doors open, windows closed; all levels CO2 overlaid [Table: Stephen Gage]. Mean CO2 levels when rooms are occupied [Table: Stephen Gage]. 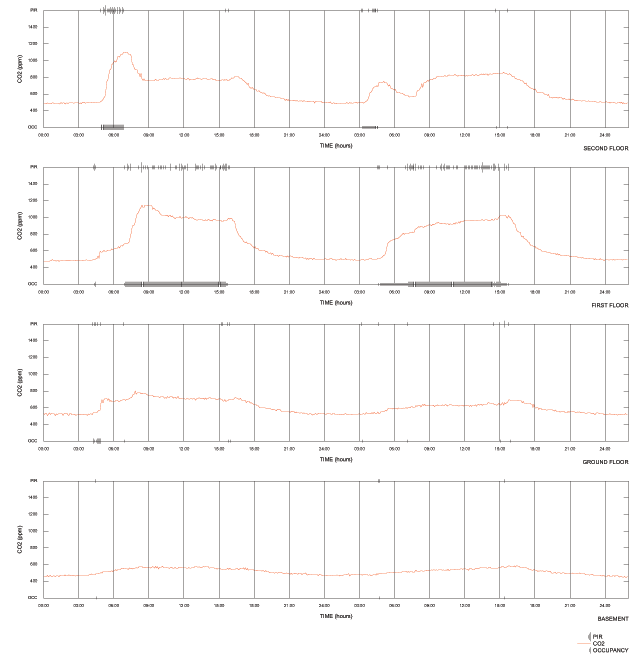 Mean CO2 signal heights [Table: Stephen Gage]. It would be useful to be able to distinguish in the Active House between fleeting visits to rooms and continued occupancy, as the latter condition will presumably create a sustained rise in CO2 levels. Figure 15 shows the rate of change in CO2 levels compared to absolute CO2 levels for the room on the first floor. It is clear that there is a time delay before a rising rate of CO2 can be detected in order to confirm occupancy. 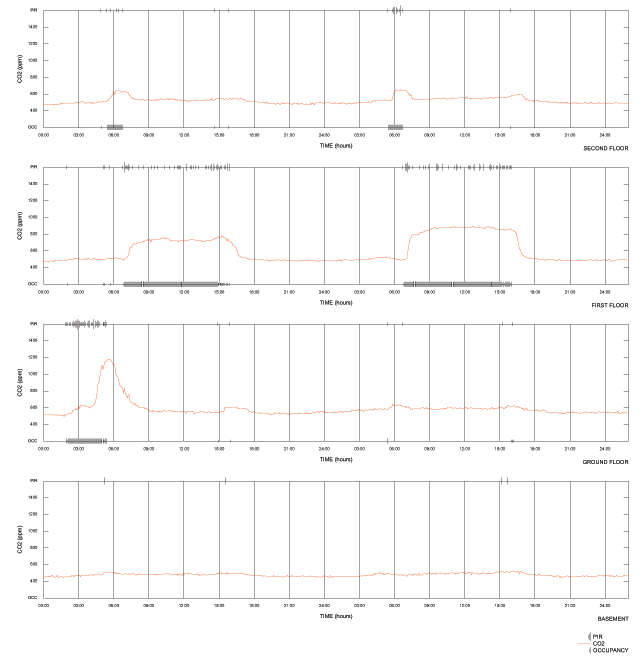 The table on Figure 16 for instance shows the time lag between a first PIR hit and a sustained rise in CO2 levels in all four of the building conditions in the first-floor room of the Active House. First-floor room smoothed CO2 level and gradient function [Table: Stephen Gage]. Time to confirm occupancy after first PIR ‘hit’ in the first-floor room [Table: Stephen Gage]. A PIR ‘hit’ that is confirmed by a sustained rise in CO2 level by the end of a period of 35 minutes indicates that an occupant is probably still in the room. It can be seen from the graphs shown in Figures 7, 8, 9, 10 that the time period for CO2 levels to fall to unoccupied levels in the Active House is very long. Is there another way of establishing whether everyone has left a room that does not rely on the figures based on occupant reporting described above? This issue is compounded because rooms have different CO2 plateau levels according to their occupancy. We can only use an approach based on the rate of change in CO2 levels once levels have fallen below a minimum raised CO2 level. In the context of the test building a minimum raised CO2 level (620 ppm) indicates that a room can be considered to be occupied whether or not a PIR ‘hit’ is observed, being calculated by taking half the minimum rise in CO2 from the mean baseline. Might it then be possible to infer absence from a room by using this gradient? Figure 17 shows how this might be achieved in terms of the Active House’s first-floor room, as derived from using a CO2 change rate threshold of approximately 10 ppm each 5 minutes, which in turn was derived from approximately twice the maximum rate of change of CO2 levels during assumed occupancy. It should be noted that this rate of change of the CO2 threshold would be unique for each floor of the Active House, and will vary from day to day. Time for absence to be confirmed using gradient [Table: Stephen Gage]. It must be emphasized that these results relate to one test house with its own particular configuration, and that further research work is necessary to see whether these results are substantiated in other types of dwellings. The most basic parameters that relate to CO2 sensing in this context are as follows: a) the volume of the room that is being studied; b) the number of people in the room; and c) the rate of air change within the space. As the test building, the Active House is ventilated by an air-to-air heat recovery system operating 24/7. For most of the year the occupants keep their windows closed, only opening windows in hot conditions in the summer for cooling purposes. All of the rooms in this test building are single-aspect. It is possible to envisage conditions in dual-aspect rooms with cross-ventilation where occupancy will not significantly affect CO2 levels. This is likely to occur in hot summer weather, especially at night. It is important, in the design of dwellings, to consider how variable permeability allows for and affects patterns of use and the internal environment. The essay has described how it is possible to infer from a combination of PIR and CO2 data from the Active House whether doors are open when some rooms are occupied. It is also possible to infer whether windows are open, although in these conditions the CO2 levels drop and data becomes less reliable. Occupancy of rooms could possibly be confirmed by mapping PIR sensing patterns onto PIR patterns for which occupancy has been confirmed by CO2 sensing in the conditions when windows have been kept closed. This would imply that initial assumptions about occupation should remain cautious, with the presumption of absence after a PIR ‘hit’ only being confirmed by an accumulation of data over time. It would also be useful to investigate how localised machine-learning could support the accurate detection of occupancy using PIR and CO2 sensing, possibly coupled with simple contact sensing systems on doors and windows. Above all, a wide range of dwelling types with different room configurations needs to be investigated, although the Active House offers a useful prototype and method for this research to be undertaken. I would like to thank the following members of the research team: Dave and Helen Di Duca, researchers in situ, Domenic Zisch, sensor installation and data collection, Sean Malikides, data analysis, Fiona Zisch, graphical production. This research project was funded by the Bartlett Architecture Research Fund. Wright, C. ‘Isi Metzstein 1928–2012’. In: The Architectural Review, 14th February 2012. Banham, R. The Architecture of the Well-Tempered Environment. Architectural Press; 1969. Meadows, DH, Randers, J and Behrens, WW, III. The Limits to Growth: A Report for the Club of Rome’s Project on the Predicament of Mankind. Universe Books; 1972. Mozer, M. ‘The Adaptive House’. http://www.cs.colorado.edu/~mozer/index.php?dir=/Research/Projects/Adaptive%20house/ (accessed 13th June 2018). Evans, R. ‘Figures, Doors and Passages’. In: Evans, R, Difford, R and Middleton, R (eds. ), Translations from Drawings to Buildings and Other Essays. 1997; 55–91. Architectural Association Publications. Macleay, I, Harris, K, Annut, A, et al. ‘Chapter 1: Energy’. In: Digest of United Kingdom Energy Statistics (DUKES). The Stationery Office; 2011. IEE. ‘iee People Counter. Trade literature’. https://www.iee.lu/en/products/building-management-security/people-counter (accessed 10th June 2017). Rian, S. ‘Geolocation with Bluetooth Beacons 2014’. https://www.mutuallyhuman.com/blog/2014/07/21/geolocation-with-bluetooth-beacons/ (accessed 20th August 2017). Anon. ‘Experts Share the Top Cybersecurity Trends to Watch for in 2017’. In: Techopedia. https://www.techopedia.com/experts-share-the-top-cybersecurity-trends-to-watch-for-in-2017/2/32330 (accessed 10th June 2017). Newman, D. ‘There Is No Privacy On The Internet Of Things’. In: Forbes Magazine; 2014. https://www.forbes.com/sites/danielnewman/2014/08/20/there-is-no-privacy-on-the-internet-of-things/#7eb541c27eb5 (accessed 14th May 2017). Scott, J. ‘My Smart Home Blog’. http://www.mysmarthomeblog.com/page--16.html (accessed 10th June 2017). Nuti, P, Yavari, E and Boric-Lubecke, O. ‘Radar Noise Floor Method for Occupancy Detection’. In: Aces Express Journal. May 2016; 1(5): 69–172. Weekly, K, Bekiaris-Liberis, N, Jin, M and Bayen, AM. ‘Modeling and estimation of humans’ effect on the CO2 dynamics inside a conference room’. In: EEE Transactions on Control Systems Technology. September 2015; 23(5): 1770–81. Crawford, S and Johnson, B. ‘How the Nest Learning Thermostat Works’. https://home.howstuffworks.com/nest-learning-thermostat.htm (accessed 12th September 2017). Sense Anywhere. ‘Products’. http://senseanywhere.com/products/ (accessed 12th September 2017). Sharpe, T, Mawditt, I, Gupta, R, McGill, G and Gregg, M. Characteristics and Performance of MVHR Systems: A meta-study of MVHR systems used in the Innovate UK Building Performance Evaluation Programme. Technology Strategy Board; 2016.